I've been a Supergirl fan since the 1970s, when I read about her in an issue of Action Comics. From then on, I always liked her, but the Great Darkness Saga story arc from the 1980s Legion of Super-Heroes really cemented my appreciation for the character. In it, after Darkseid has flattened the entire Legion and Superboy, Suprgirl takes him on one-on-one, without flinching, and punches him into the sun. Supergirl's bold confidence impressed me in that issue, enough that I started buying her own series (The Daring New Adventures of Supergirl). Although the stories and villains in that series weren't very good, I enjoyed the characterization of Supergirl, and before long she was my absolute favorite superhero. Then, of course, DC killed her off in 1985, and when they brought back another character called "Supergirl" a few years later, it was a shape-shifting being made of proto-matter, with telekinetic powers rather than true Kryptonian strength and invulnerability. I was therefore skeptical when I started reading Peter David's rendition of this new Supergirl. However, David did an outstanding job, and it was only a matter of a few issues before I started enjoying this new Supergirl in her own right. Sure, it wasn't Kara Zor-El, wasn't a real relative of Superman. But David wrote the series well, and I ended up liking Matrix Supergirl well enough (though always wishing for Kara to come back). I followed the series for 32 straight issues, until I quit reading comics in 1999. Because I had enjoyed David's Supergirl so much, when I got back into comics a few months ago, it was only natural that I would look into adding to that collection. I quickly discovered that there were 80 issues total in the series, some of them rare and hard to find. Therefore, I needed about 48 more issues to complete the entire collection. Fortunately, my comic-book shop had about another 32 of them, so I was able to buff my collection to about 64 of 80 (not all consecutive, of course) just from that store. The last 16 or so issues were harder to get. I obtained a few from Mile High Comics, bringing my total to about 69. 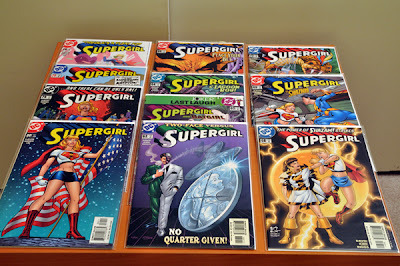 Then, finally, after placing an order with Lone Star Comics about a week and a half ago, today I received the last 11 issues I needed to complete the full 80-issue Peter David Supergirl collection. Here's a look at those last 11 books. Some of these seem to be quite rare. Not only didn't my local shop have them, but neither did Mile High Comics, in any condition, for any price. Thus, I ended up spending a pretty penny for a few of them. #79 was almost $10, as was #76 for some reason. Issues 68-69 guest star the Shazam! family and were over $6 each. The rest were $4 or less, which is a more common price for a series like this. As I said recently when describing the completion of two other collections (the previous Supergirl series, and the Kesel Hawk and Dove series), there is always a bitter-sweet feeling when completing a collection that is no longer ongoing. It's very rewarding to close out the set. On the other hand, there is always a little sadness knowing that, forevermore, there will never be another story from this series that I can buy, and read. These last issues are "it." Fortunately, in this case the series is quite long - it takes a long time to read 80 comic-books. I started in on re-reading the first 32 issues some weeks ago, and I'm just closing in on #60 now. Of course, I have been pacing myself, so that my reading doesn't outstrip my purchasing. Still, it will be a little while before I'm complete done reading the series, even though I am already done buying it. So I have a little more fun to anticipate. Next up for Supergirl, I will begin working on the fourth full series (volume 5 if you count the 4-issue mini-series from the early 1990s). I will mostly get that one in trades, I think, just for the stories. I know how it feels to complete a collection. 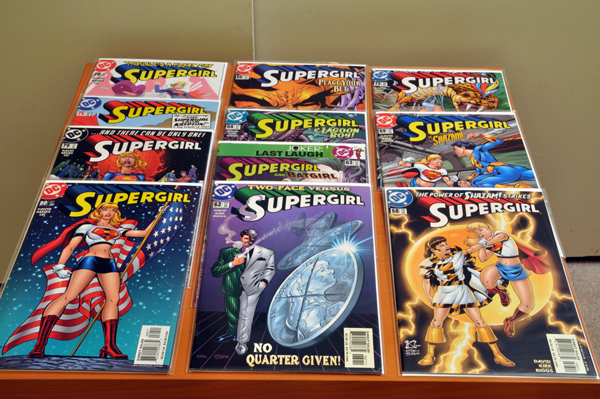 Just like you, I've been a Supergirl fan, although I only started about 2 years ago. But I became so obsessed by her that I decided to collect all her series and later, every single issue in which she has appeared since 1959. 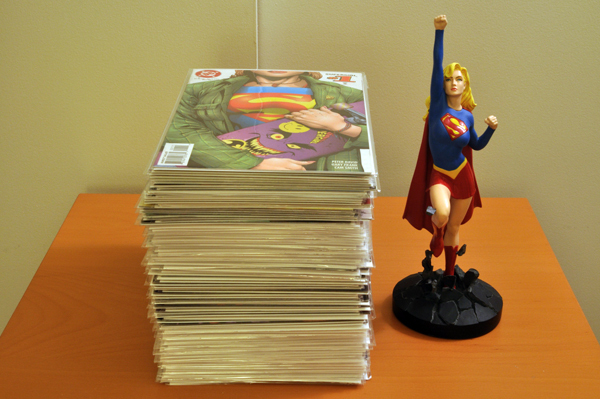 I'm glad to say that I'm very close to owning all the 1000+ Supergirl related comic books. That Matrix statue is amazing! It's on my wish list too.